The process in Windows Azure that backs up a SQL Database to blob storage is not transactionally consistent, which is why the initial database copy is required. The data center and server name can be obtained from the SQL Databases section of the Windows Azure Portal. 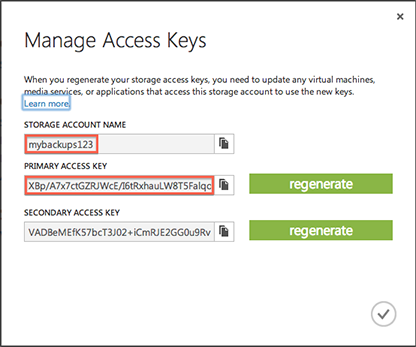 The Azure storage account name and access key can be accessed in the Storage section of the portal, by clicking the Manage Access Keys button at the bottom of the portal. Finally, by specifying the -cleanup argument, the utility will delete the SQL Database copy it creates after the backup is successfully created. The above command will remove files equal-to-or-older-than sixty days from the container “sqlbackup” – the default container used by SQLDatabaseBackup. The details of each file deleted are printed to the console. By scheduling these two utilities on an available machine you’ll have painless, affordable backups for any of your Windows Azure SQL Databases. This entry was posted in Development, Microsoft .NET, Technology, Windows Azure on July 10, 2013 by Nathanial Woolls (Nate). Thank you for posting the AzureStorageCleanup project. I compiled it, specified the necessary parameters, however, when running it it states that there are not files to delete which are X days old. All files are older than 1 day old. What could I be missing? Hi Chad. Thanks for the feedback and I’m sorry to hear you are having troubles. Unfortunately I am not able to reproduce this issue. Can you try setting a breakpoint in StorageCleaner.Cleanup and stepping through? The code is pretty brief and simple so may help to clarify what is going wrong.